United States President Donald Trump's embattled Health Secretary Tom Price has resigned amid a raging scandal over his use of expensive private planes for official travel, with the media speculating the names of two Indian-Americans as possible candidates to replace him. Price, 62, resigned on Friday, saying he regretted that 'recent events have created a distraction' from the work of the health department. The names of two Indian-Americans -- Seema Verma and Bobby Jindal -- have emerged as possible candidates. He previously apologised after making 26 private flights since May. Government officials, except those dealing with national security matters, are required to take commercial flights for work related travel. The total combined cost for Price’s flights exceeded $1 million, according to media reports. 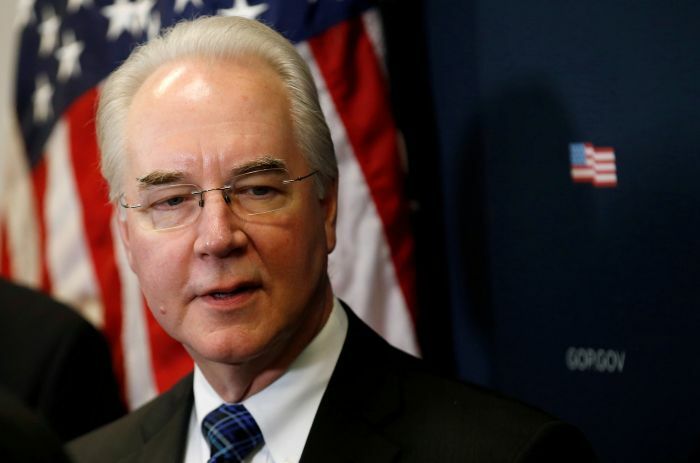 A White House statement said President Trump had accepted Price's resignation, adding that Don J Wright had been designated as acting health secretary. Wright is currently deputy assistant secretary for health. After Price's resignation, the US media immediately started speculating on the potential nominees for his replacement in the cabinet. Most of the media outlets have placed Verma on the top of the list. Currently administrator of the Centers for Medicare and Medicaid Services, Verma hails from Indiana, the home State of Vice President Mike Pence. Trump so far has not indicated his choice. Among the dozen odd potential candidates for the position, name of another Indian-American Bobby Jindal has also figured. Jindal, the two-term former Governor of Louisiana, was one of the fiercest critics of Trump during the US presidential election campaign last year. 'But Jindal is steeped in health care,' Politico reported. 'He was doing health policy academically and professionally before he entered politics,' it said. 'Speculation about who would succeed Price permanently has focused on Seema Verma, who oversees Medicare, Medicaid and parts of the ACA. She’s a close ally of Vice President Pence. Former Louisiana Gov Bobby Jindal and Food and Drug Administration commissioner Scott Gottlieb are also seen as potential candidates,' well-connected Axios reported. Verma, who has been playing a key role in repeal and replace of Obamacare, has won accolades from Trump multiple times. If nominated by Trump, Verma would be the second Indian American -- that too a woman -- after Nikki Haley to be nominated to a presidential cabinet post. Haley is the US Ambassador to the United Nations. 'The Trump administration and congressional Republicans might decide Seema Verma is too valuable exactly where she is,' New York Magazine said. 'As for Bobby Jindal--- well, on paper he is perfect for the next HHS secretary,' it said. Other names floating around are Rock Scott, former Florida Governor; David Shulkin, Veterinary Affairs secretary; FDA Commissioner Scott Gottlieb; long-time House Republican Marsha Blackburn; Long-time HHS bureaucrat Don Wright; and Neurosurgeon Ben Carson. In just eight months since Trump took office, he has fired or lost his chief of staff, chief strategist, national security adviser, press secretary, two communications directors, a deputy chief of staff, a deputy national security adviser, the FBI director and many other aides and advisers. Will US President Trump be impeached? A POTUS so out of his depth! Why did Trump attack India?